Yawning is involuntary. It often coincides with stretching the limbs, which is known as pandiculation. We yawn when we’re tired and about to fall asleep. We yawn when we wake up. Dogs yawn when they’re about to attack. Why? I hypothesize that the only purpose of yawning is to stretch/relax the muscles of mastication. 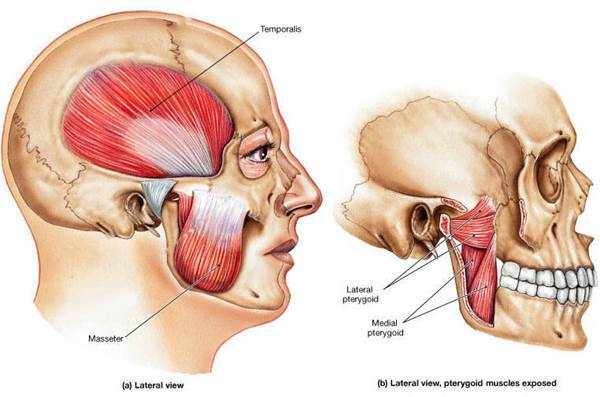 For humans, the major ones are the masseter and temporalis. The minor ones are the medial pterygoid and lateral pterygoid. The reason we yawn upon waking up is to have the jaw muscles ready to go. It’s a like warm-up stretch for the jaw so that we can gnaw and talk through the day. I hypothesize that yawning when we’re about to fall asleep is a preventive measure against the clenching and grinding of teeth that can occur during sleep. A tight muscle (from heavy use) is like a ticking time bomb. It’s prone to involuntary contractions. Have you ever had a calf muscle cramp while sleeping? The jaw equivalent to this would be clenching the teeth while sleeping. I hypothesize that this is caused by overly-tight masseter muscles. Similarly, I believe teeth grinding while sleeping is caused by overly-tight medial and lateral pterygoid muscles. The purpose of yawning when tired is to stretch/relax these jaw muscles so they don’t wreck our tooth enamel during our unconscious state of slumber.